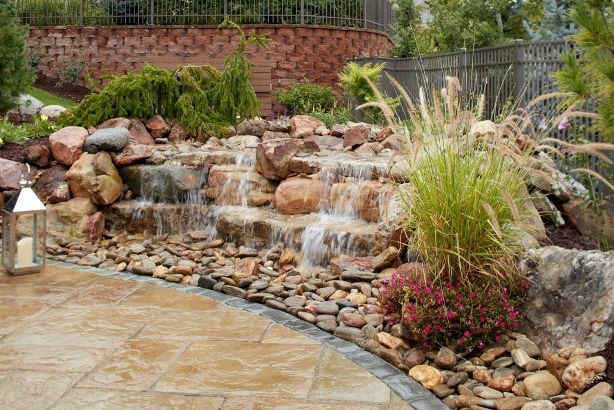 A waterfall feature can enhance your landscape, poolscape or outdoor environment for a lifetime. 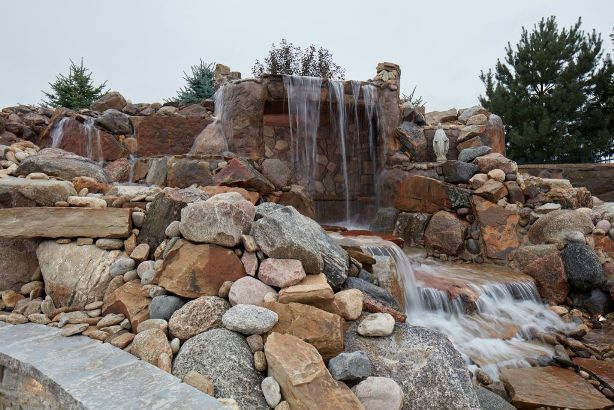 Since 2001, Elite landscaping has created custom stone waterfalls, grottos, and even bubbling brooks for homeowners in Omaha, Nebraska, Lincoln, Nebraska and throughout the entire Midwest. Elite Landscaping is a swimming pool contractor in Omaha, NE specializing in outdoor living and design. 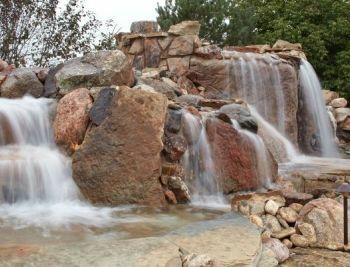 We create and install truly unique waterfall and grotto features in landscapes of all kinds. Add wow-factor to your poolside patio, or improve the visual appeal of your outdoor landscape design. 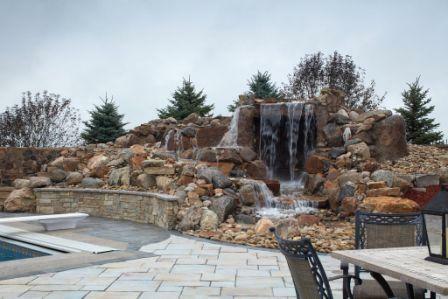 Whatever custom water feature you desire, Elite Landscaping can make your outdoor living dreams come true. When it comes to luxurious landscape and water feature ideas, you can trust Elite Landscaping to provide the highest quality design, installation and professional workmanship for every project. 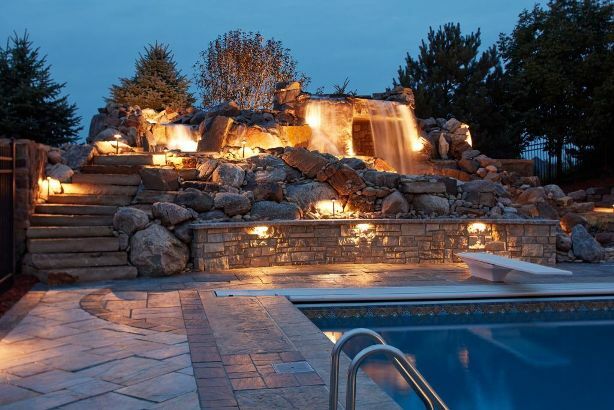 This 12’ high waterfall and 7’ high grotto was designed to expand a swimming pool landscape. 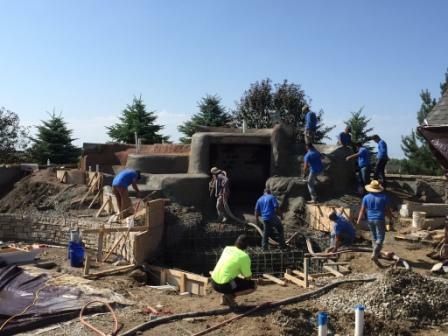 The homeowner’s dream was to provide a wonderful backyard water feature that the whole family would be drawn to, keeping the kids and grand kids close to home. For waterfalls and splash pools, we start by building a foundation of clean rock. 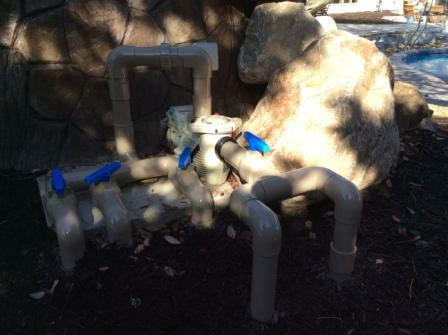 For the pump system, we never use flexible pond piping. Our professionals insist on only rigid, pressurized PVC for long-lasting durability, and we pressure test it before installing it in concrete. Elite Landscaping creates a rebar frame to distinguish height and elevation customized to our client’s preferences. 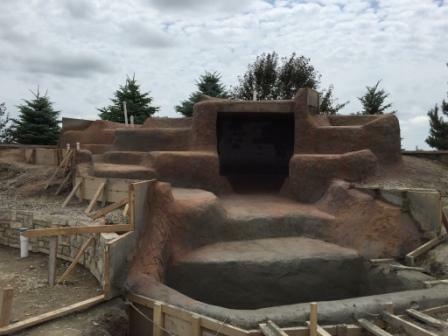 Elite Landscaping then shoots shot-crete to create the base of your waterfall, slide, or grotto feature. The concrete is hand-troweled and sculpted custom to your design. All areas of exposed concrete are colored and textured for a natural look and to not leave any area unfinished. 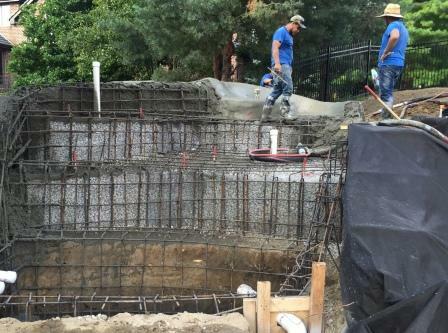 The structural concrete is durable enough to support the placement of large boulders and stones. Hand-picked boulders are secured in place with concrete, and the Elite Landscaping team custom matches the color of the grout to blend any gaps with the natural look of the stone. The concrete permanently secures the boulders for safety, but also prevents unwanted animals or insects from accessing the gaps. Hand-molded concrete is used to direct the waterflow for a clean, beautiful, and long-lasting water feature. Stonework inside the grotto includes a mortared flagstone floor. What sets every Elite Landscaping splash pool or waterfall apart is the use of quality components that provide convenience, energy efficiency, and safety. 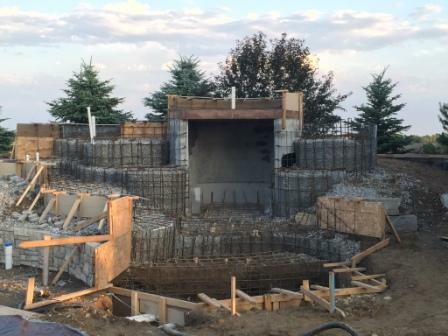 We use two-stage, self-priming Pentair WhisperFlo pool pumps instead of a pump that relies on a GFI outlet. A fully programmable timer is installed at the pump that can also be accessed through an app on your smartphone. This allows you to easily set the speed of water flow, program on/off times, and control any outdoor lighting features. 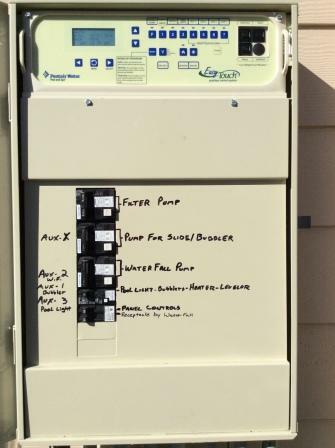 A Pentair IntelliTouch panel allows you to easily turn on or off the actuator valve to conserve water and energy. Self-recirculating waterfalls can be adjusted from 800 rpm to 3500 rpm, allowing you to reduce noise and water useage. 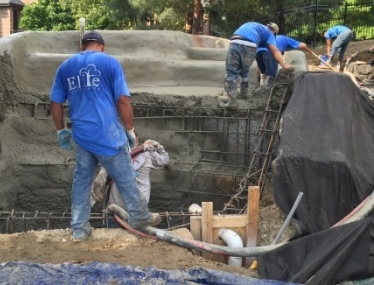 Elite Landscaping installs smaller water features that pump from 14,300 gallons per hour, up to our largest features that pump upwards of 46,800 gallons per hour. Water flow is directed by valves to keep the water where you want it: flowing over the top, trickling down rocks, or into the splash pool. Our two-stage waterfall pump is professionally bonded by a licensed electrician, and grounded, so there is no risk of shock while sitting in the splash pool or grotto. The maximum water depth is eight inches, so there is no need for a fence around your entire yard. All the rocks used in entry areas or walking paths are a mix of skipper rocks or mortar-set flagstone. These stones are grouted, so you and your guests are walking on a flat, smooth surface that is safe - and comfortable - for both adults and children. Contact Elite Landscaping to make your outdoor dreams a reality!